The Alaskan fishing industry brings in billions of dollars per year. It’s incredibly profitable and relies on hard working adventure seekers who head to Alaska each summer to earn their sea legs and keep this industry afloat. One cool job in this industry is working on a tender boat. Tender boats maximize the efficiency of the Alaskan fishing industry. Fishing boats cruise the waters off the coast of Alaska in search of salmon, black cod, crabs, and other seafood delights. When their boat is full of fish and they don’t want to waste time returning to shore to offload their catch, then tender boats come to transport the cargo. Tender boats act as the middleman between fishing boats and fish processors. Tender boats head out to sea and meet fishing boats that are at capacity. The tender boat buys the fish, loads the fish onto the tender boat, and transports the fish to the nearest fish processing plant where they are bought, cleaned, and processed so they can ultimately end up on your table. The tender boat also resupplies the fishing boats with food, fuel, and anything else they need so that they can stay out longer and make more money. While the tender boat zips back and forth, the fishermen can take advantage of more fishing time and the fish processors can accept more fish. Tender boats range from 50 to 130 feet and usually only have 4 or 5 people on board – a skipper, engineer, cook, and deckhand. Tender boat jobs require a good set of sea legs and the ability to be a team player. You’ll be on a boat most of the time. The crew needs to work as one big team to take care of all boat duties – repairs, navigation, loading, unloading, cooking, and everything else. 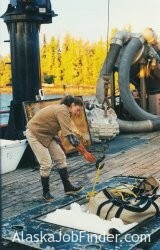 If you’re considering a gig in Alaska next summer, working on a tender boat is an excellent and exciting choice. A job on an Alaska tender boat is also a great way to make important connections with captains of fishing boats. These connections can really increase your chances of finding a good deckhand job in the future. In the Members Section of AlaskaJobFinder we provide you some proven tips and strategies for getting tender boat jobs in Alaska. 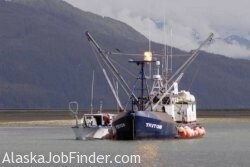 A number of tender boats also post their job openings on AlaskaJobFinder each year. As a Member, you will have access to these job postings and can apply for these positions.